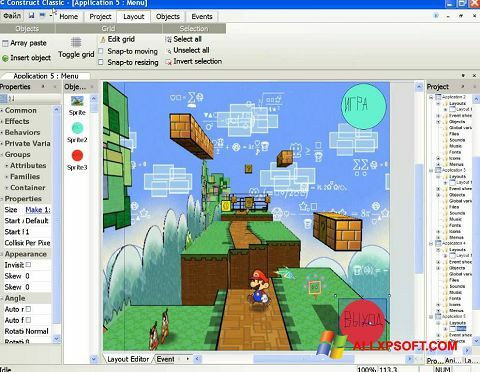 Construct Classic for Windows XP - a popular program that helps to create software and virtual games on a personal computer. It allows you to develop two-dimensional and three-dimensional objects without the use of supporting scripts. The utility is suitable for new users taking the first steps in the field of programming. It has a multilingual simple interface, provides reference information about all working tools. When launching a product, you can download its trial or full version, which differ in a set of functionality and additional plugins. You can free download Construct Classic official latest version for Windows XP in English.